At AirZone, we offer a full range of high quality American Standard, Lennox and Amana heat pumps that will save you money every month on your utility bills. A heat pump has both a condenser and an evaporator allowing the unit to switch between heating and cooling. This allows the heat pump to operate year round by heating in the winter (supporting your furnace) and cooling in the summer. A heat pump also provides easy heating and cooling operation with more precise temperature control (when paired with an appropriate HVAC system). A heat pump is the perfect addition to a HVAC system that contains an oil, propane, or electric heater. These customers are the ones that benefit the most from a heat pump product. As a heating and cooling leader, we are dedicated to bringing our consumers the best technology and innovative designed HVAC systems. We offer a full line of heat pump services including new installation, annual heat pump maintenance, diagnostics and repair. We also offer HVAC system designs that utilize heat pumps to provide greater efficiency for your home and help your system to last longer by reducing the load on the furnace. We specialize in cold climate heat pumps that are correctly sized for your home. Our heat pump products are capable of heating a home down to -25 degrees celcius. This can lead to tremendous savings on your utility bills! A heat pump is an all-in-one cooling and heating system for your home. In Ottawa, heat pumps are paired with a furnace to offer exceptional utility savings. During summer months, it works like an air conditioner, moving heat from inside your home to the outdoors. When the weather’s cooler, it does the opposite, taking heat from outside and moving it inside. Many people in the Ottawa Valley do not realize how much they can save by taking advantage of a heat pump. We recently installed a heat pump for a customer in the Pembroke area. They have an oil burning furnace that was costing about 200 dollars each month during the wintertime. After installing a heat pump, there bill dropped 75%!! They are now paying only $50 dollars a month after taking advantage of the heat pump savings. If you are in the Valley and have an oil furnace, a heat pump consideration is a must! We offer heat pump products starting at $79 dollars per month (financing). If we use the example above, our recent Pembroke customer experienced a savings of $150 per month on their utility bill. In this case, they will pocketing and additional $70 dollars per month. That’s a huge savings on their heating costs with the added benefit of a heating and cooling heat pump. Our heat pump financing program is typically on a 12 year term. We recommend that our customers finance the heat pump and see how much they are saving each month. Our flexible financing allows homeowners to pay off the loan at any time. You can also adjust the amount you pay per month. By increasing your monthly payment using energy saving money you can not only break even on your monthly costs, but also have the unit paid off way faster. This is a great option for anyone in the market for a new heat pump product! The average consumer in Ontario pays off their HVAC financing purchase in 3.5 years. Another consideration for heating pump installations is that it also acts as an air conditioner. When you have a heat pump installed, it cools in the summer and heats in the winter. This removes the need for an air conditioner purchase (since you will already have one). AirZone provides heat pump maintenance services to the greater Ottawa area including Pembroke and the Valley. Annual heat pump maintenance is extremely important for keeping your unit running at it’s best. Our maintenance services include a full analysis of your heat pump system. We examine the airflow for duct leaks or inadequate operation. We also check your refrigerant levels to ensure they are correct. We combine our unit testing with thermostat testing to ensure that the heat pump is operating correctly and at it’s best. Please be aware that heat pumps cost more upfront, yet pay for themselves quickly since they’re utilized all year round. When used as part of a Hybrid Heating Dual Fuel System, heat pumps work perfectly for keeping a steady flow of comfortable air circulating throughout your home, preventing energy loss that may occur from frequent start and stop thermostat changes. We choose our suppliers carefully to ensure that they are consistently delivering quality products to our customers. 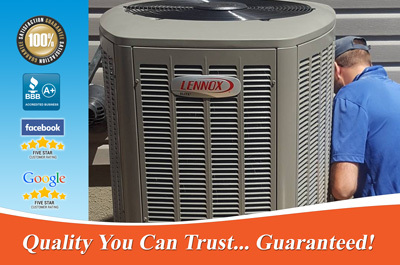 We offer heat pumps from American Standard, Amana and Lennox. Please click on the logos to have a look at the heat pump products available from each supplier (links open in a new window). The first step in our service process is to have a qualified HVAC professional (comfort advisor) visit your home to give you a free no obligation estimate. We will examine the current furnace, air conditioner, thermostat, and ductwork within your home. After this analysis, the comfort advisor will sit down with the homeowner to provide written recommendations about new equipment and/or repairs. With this written quote, you are welcome to compare costs with other companies. We offer very competitive pricing on quality heat pumps and you will receive the best installation and customer service with AirZone. We don’t ever want to pressure you into a purchase, which is why we have implemented this approach. If you are interested in financing, please let us know. Our heat pump financing approval is fast and easy and can be completed with the comfort advisor on site. As an alternative, you may apply online at a later time via our financing portal. After you have made a decision for your purchase, we will receive a deposit and order your equipment. Once received, we will schedule an installation date. Note that many times we will have the equipment in our warehouse for a fast heat pump installation. During the installation, our installers will answer any questions you may have and complete the install. After this is done, our heat pump technicians will show you the newly installed unit and offer instructions on how to operate it. A walk through will be completed with the customer on site. After this is complete, we will ask for the outstanding balance to be paid. We will then provide you with all of the warranty information (written) along with instructions on how to claim any applicable rebates. Our process involves written documentation throughout the process to protect your purchase. After you become an AirZone customer, you may want to refer your friends! We reward your loyalty with a 50 dollar prepaid gift card for every successful referral that results in a sale. Thank you for choosing AirZone for all of your Ottawa heating and cooling needs! Due to our work over the past few years in the Pembroke area, we are quickly becoming know as the go to company for heat pumps in Pembroke. We have build a solid reputation in the area for quality heat pump installations, and stand by our work with our quality you can trust guarantee. We maintain an A+ Rating with the Better Business Bureau, and have a very high rating on Google and Facebook. We also gladly provide true testimonials and references to new customers. The best way to determine how much you will save with a heat pump installation is by talking to people in the Pembroke area who have had one installed by AirZone. We offer our services to the greater Ottawa area including Pembroke and the Ottawa Valley. Did you know that two of the Owners of AirZone reside in the Ottawa Valley (Pembroke)? We are proud of our roots and thrilled to offer our services to the greater Ottawa area including the Valley. Our family business is large enough to offer volume pricing but small enough to offer the main street approach that cares about our customers. We are also small enough that you are welcome to provide feedback to the owners at any time with any questions, concerns, or compliments you may have. We are here for you! When you choose AirZone for your heat pump or other HVAC installation, you are choosing a company who is dedicated to the best in customer service. Part of this promise includes the red carpet treatment! This means that our installers will leave your home in the same (or better) condition that they found it (with a nice new equipment addition). We always clean up after ourselves and wear booties to protect your floors. We are also extremely respectful of the residents within and try our best to keep noise at a minimum. The result is a professionally installed heat pump, air conditioner, or other new HVAC equipment installed with the least disruption to the people within the home. We back this promise with our quality you can trust guarantee! It’s just one of the major differences that you will receive when you hire AirZone for all of your heating and cooling needs. As a full service HVAC dealer, we also offer additional services such as new furnace installations. We specialize in not only heat pump services! Many customers take advantage of our broad experience for products such as gas fireplace, indoor air quality testing, and a lot more. We started as a furnace and air conditioner installation company and have expanded to offer additional services to our clients. Our goal is to raise the standard for heating and cooling companies by delivering consistent expert HVAC products and services for both residential and commercial HVAC customers. We specialize in Ottawa Furnace and Ottawa Air Conditioner sales and service including repairs and annual maintenance. All of this is backed by our quality you can trust guarantee! We Started our business as a small company with our first installation being a new furnace in Ottawa.